The posthumous race to acknowledge his genius was a wry tribute to an artist who, during his lifetime, was better known for his buffoonery and relentless self-promotion than he was for the quality of his work. 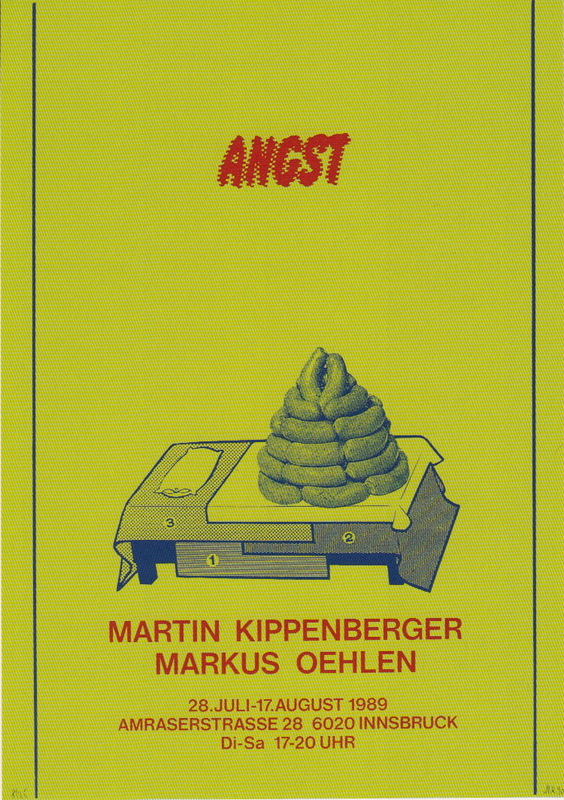 History has been kind to Martin Kippenberger. Following his untimely death in 1997 at the age of 44, the art world scrambled to retrofit Kippenberger into the Postmodernist canon. The posthumous race to acknowledge his genius was a wry tribute to an artist who, during his lifetime, was better known for his buffoonery and relentless self-promotion than he was for the quality of his work. 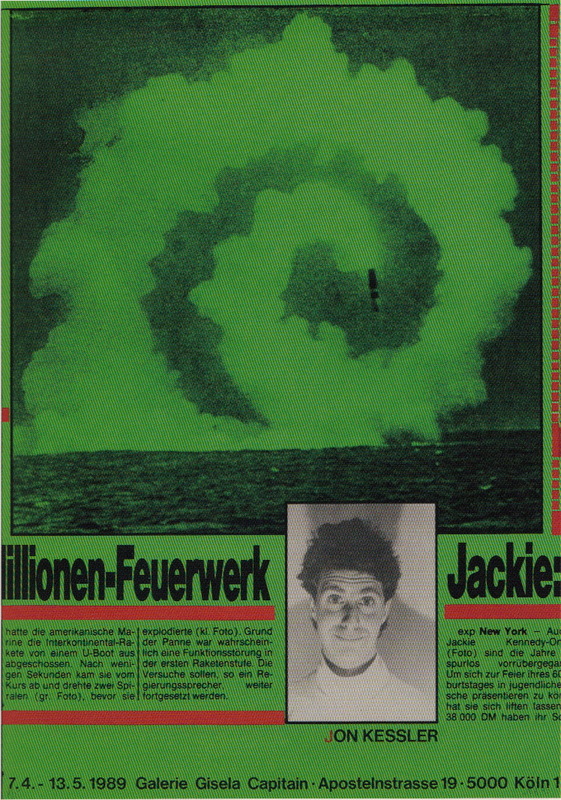 Critic Waldemar Januszczak once described Kippenberger as ‘an aggressive and long-winded German drunk who would spoil any situation he walked into.’ Unwilling to commit to a consistent medium, method or style, he lurched from one project to the next, cocking his leg at the art world, the public, and himself, until he was taken down, bloated and dissolute, by liver cancer. 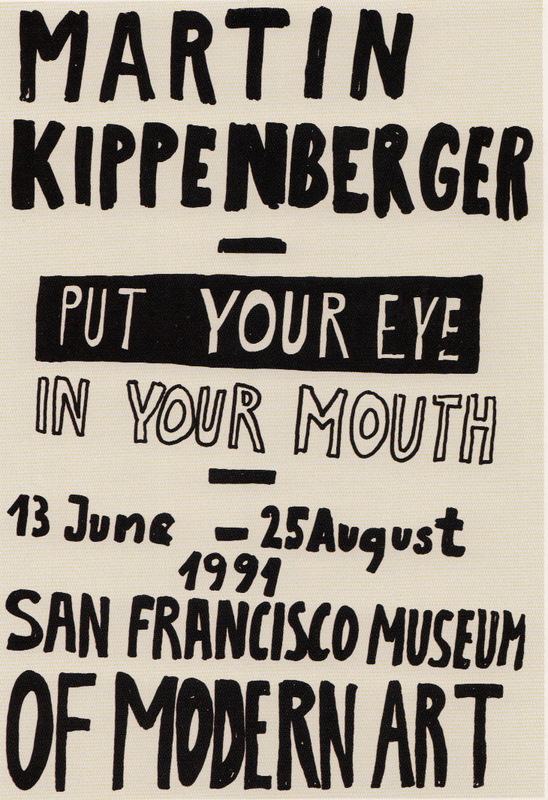 Kippenberger’s work was thuggishly provocative and often inaccessible. It was also chaotically inventive, energetic, and … good. 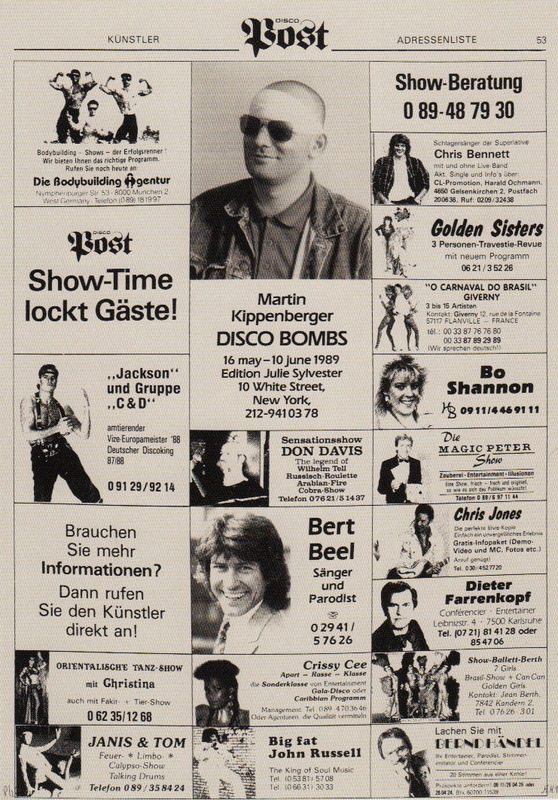 And the banality of his demise – cancer will never make it onto the shortlist of rock ‘n roll deaths – was grimly appropriate, given Kippenberger’s reliance on the banal and the commonplace as sources of inspiration. Kippenberger’s fondness for the trivial – and his considerable skill as a graphic designer – is nowhere more evident than in his poster work. 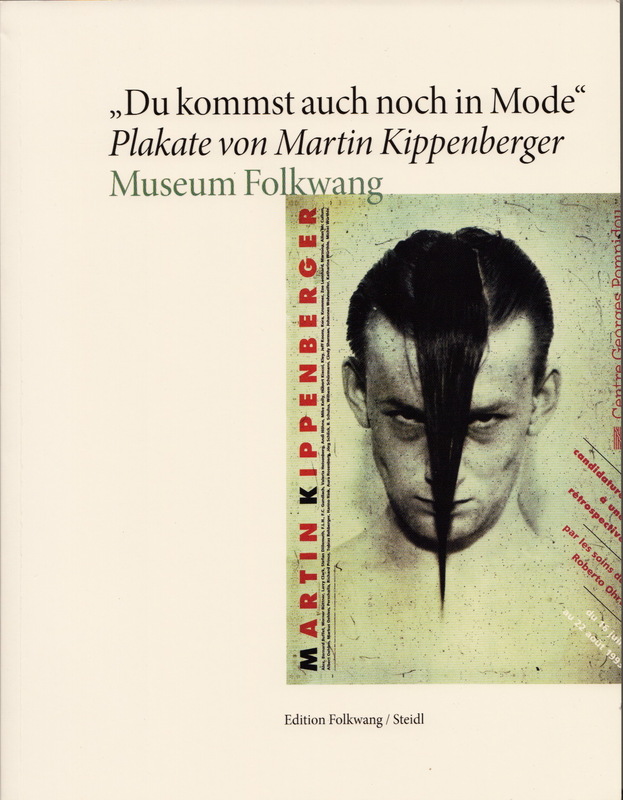 „Du Kommst auch noch in Mode“ (‘You are still in fashion’) was produced to accompany an exhibition of Kippenberger’s posters at the Museum Folkwang in Essen, Germany, in 2014-15. 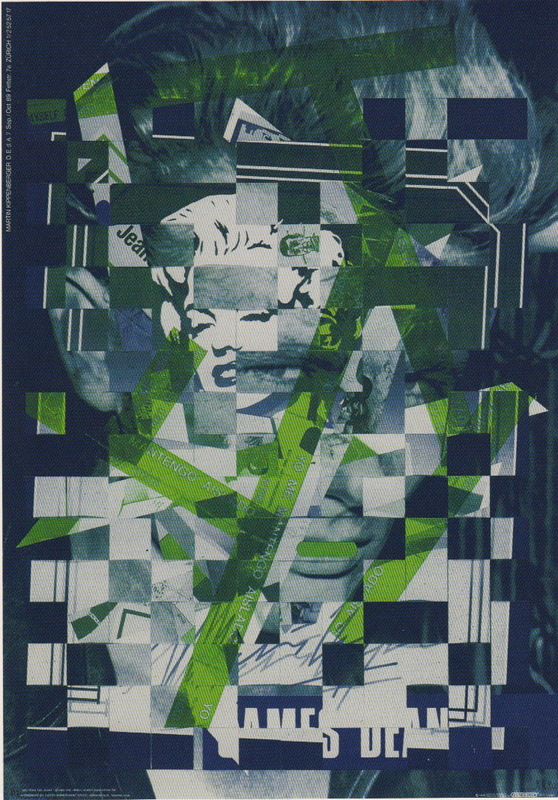 Created mainly for his own exhibitions, Kippenberger’s posters also showcase his talent for appropriation and recontextualisation – key skills for any postmodern artist, and ones at which Kippenberger excelled. There’s no sidestepping his talent for dragging the minutiae of contemporary life blinking, into the spotlight, to ad-lib with the whims of the art world. It all looks like Postmodern art practice at its most nightmarish – pastiche, irony, and self-referentiality run amok, at a time when these tactics were being put through their paces by a gilded, cynical art world ready to tout the most callow post-Dadaist bodgework as another droll (re)incarnation of the not-quite-new. 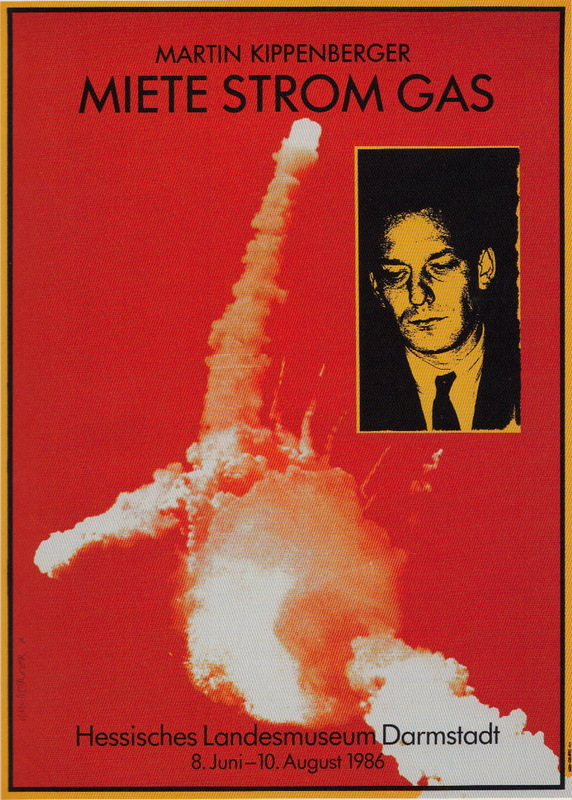 Kippenberger’s favourite subject, however, was himself. 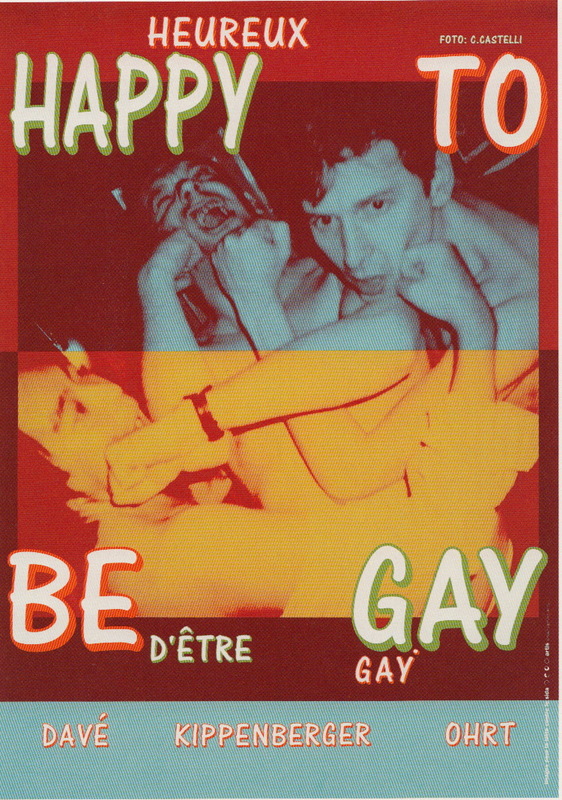 As well as vehicles for self-promotion and self-parody, his posters also acted as a kind of diary – a public commentary on his not-so-private life. He appears in many of them, in various guises – sometimes as himself, sometimes in masquerade (as a punk, a businessman, a sunburned tourist). Art, life, and cult of personality collapse here into a sloppy, shambolic heap: Andy Warhol minus the OCD and the carefully managed public image. 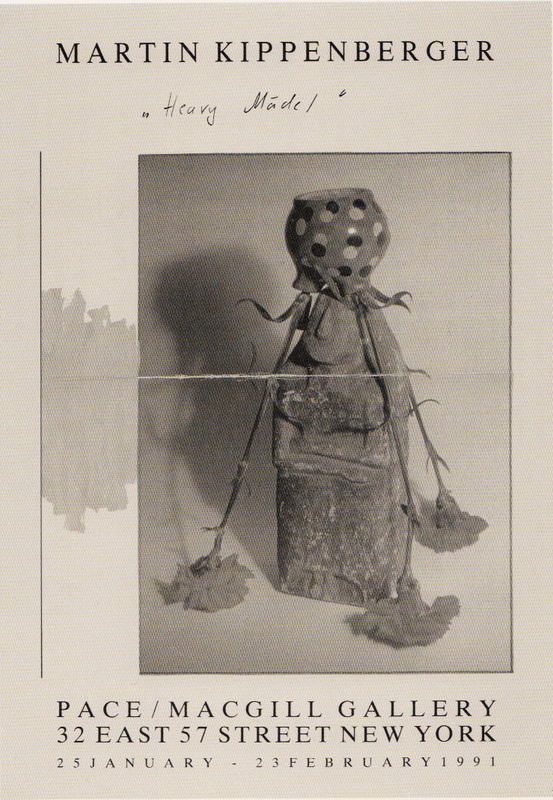 The resulting work was often wilfully obscure. 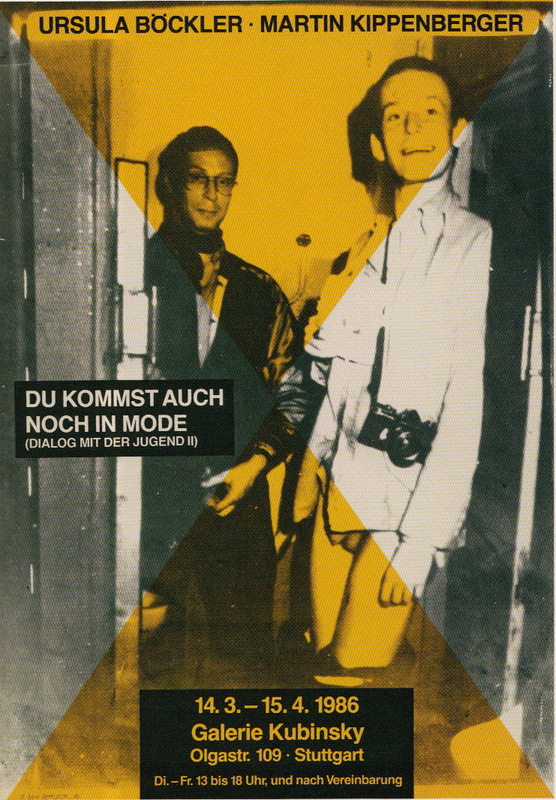 ‘Du kommst auch noch in Mode’ was the title of a 1986 poster (subtitled ‘Dialog with Youth II’) which itself refers to an earlier painting (‘Dialogue with Youth’), made in 1981 as a response to a beating from a group of Berlin punks. 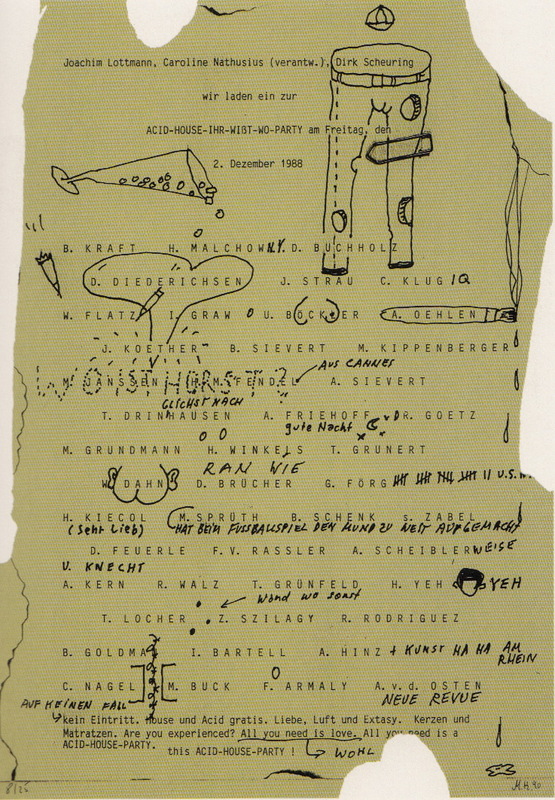 But neither the title of the later work, nor the image – of a grinning Kippenberger standing with a camera over his shoulder and his trousers around his knees – gives any clue about this lengthy chain of association. It all looks like Postmodern art practice at its most nightmarish – pastiche, irony, and self-referentiality run amok, at a time when these tactics were being put through their paces by a gilded, cynical art world ready to tout the most callow post-Dadaist bodgework as another droll (re)incarnation of the not-quite-new. It was bewildering to anyone even slightly outside Kippenberger’s orbit, as alienating as it was self-conscious and knowing. YOU MIGHT ALSO LIKE: Upstairs at Eric's - Game Recognize Game. But Kippenberger’s posters are also clever, playful, and often hilarious, even when you’re not really sure what you’re looking at. 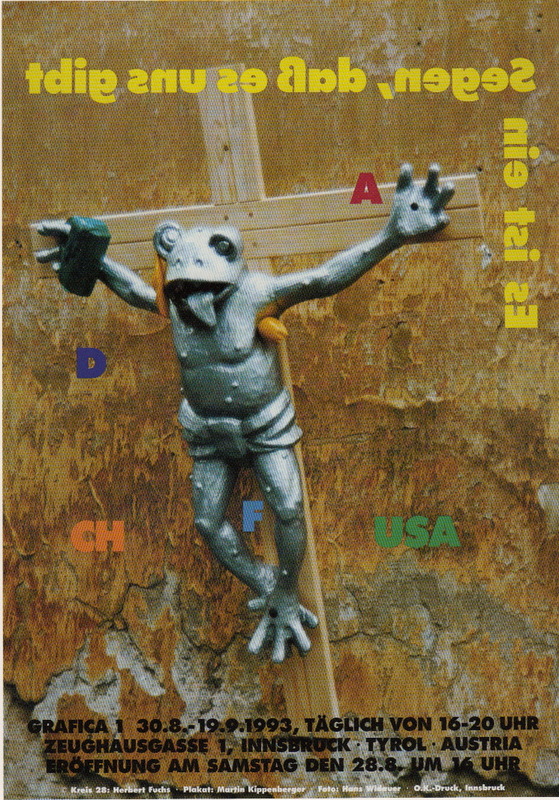 Whatever else he may have been, Kippenberger had a remarkable pan-historical imagination. The drunk who liked to pull his pants down at parties, who lived by the motto ‘peinlichkeit kennt keine grenzen’ (embarrassment has no limits), is still in fashion. Posted in Reviews and tagged Andy Warhol, Eugenie Shinkle, Germany, Martin Kippenberger, Museum Folkwang, Photobook, Poster, Postmodernism, Review, Steidl.